What is DJO’s Home DVT Program? Program: DJO Global has a compliant and cost effective solution for preventing DVT at home. Our home program provides a compression device for patients that need home prophylaxis. If needed, we provide a risk assessment tool to determine which patients need home prophylaxis. 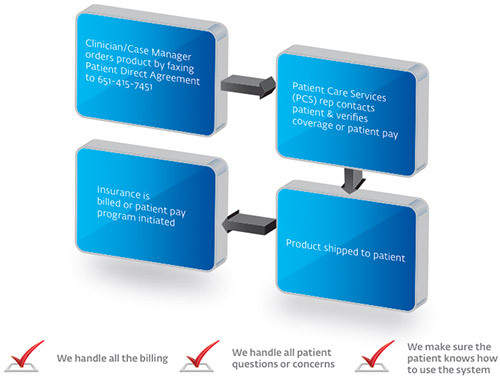 We handle everything from shipping, insurance billing and patient education for hassle free program. Your sales representative will provide you with the Patient Direct Agreement that you’ll sign for each patient. We handle the rest! DVT prophylaxis is not covered by Medicare, but it is covered by some private payers for home use only. VenaFlow or VenaPro returns/troubleshooting: Call 800-336-6569, option 1, option 3. Be prepared to give affected device serial numbers and reason for return. How long does it take to charge the VenaPro system? While powered off, it takes 3.5 hours to charge from depleted state. While powered on, it takes 4-4.5 hours to charge from depleted state. Does VenaPro have any studies backing it? Not yet, but using compression devices with and without anti-coagulants at home for DVT prophylaxis is documented in several recent studies. The pumps used in those studies have similar pressure ranges and cycles as VenaPro. They all move blood. How can I track patient compliance on VenaPro? Does the VenaPro fit all patient sizes? Since VenaPro is a single patient use device, how long does the device continue to work?